The legend that is Stanley Clarke dropped by the UK, we sent Josiah Hartley down to his show at The Fleece in Bristol to review. It was only last summer when The Fleece hosted American bass giant Victor Wooten for what were two fantastic Bristol debut shows. Amid the city’s many live music venues, this proved to be a major coup for the landmark establishment. Technically speaking, Wooten is a darn tough act to follow, so the likelihood of seeing another bassist of similar virtuosity and stature here again anytime soon seemed pretty slim - or so it would seem until last Wednesday night. The Fleece pulled off the unimaginable through the choice booking of the legendary bass extraordinaire that is Stanley Clarke, incidentally, who not only happens to be one of Wooten’s biggest bass heroes, but is also an enormous inspiration to around three generations of bass players, and other musicians the world over. Equally masterful on both the electric bass and acoustic double bass, Clarke’s transcendent skill on the instrument first came to prominence in the 70s as a co-founding member (alongside Chick Corea) of pioneering jazz-rock fusion band Return to Forever, before his solo career shortly took flight during the same decade. Over the course of his prolific career, which is now approaching fifty years, the Grammy Award-winning Philadelphian has also collaborated - as either a sideman, composer or producer - with countless world-renowned artists including Aretha Franklin, Paul McCartney, Carlos Santana, Roy Ayers and Jeff Beck to name a few. While on top of all that he’s also made a name for himself as an accomplished TV and film composer; with Boyz N the Hood, Romeo Must Die, and The Transporter among the many scoring credits under his belt. It’s easy to see exactly why the man is globally recognized as a true living legend. Stopping off in Bristol for the third date of his UK tour - preceded by two sell-out shows in London and Manchester, respectively – it marked the iconic musician’s first time ever playing outside the English capital, which essentially meant that this rare gig was an absolute must-attend for serious bass players and jazz/fusion fans alike. Armed with his Alembic signature bass guitar and sporting sunglasses, Clarke and his three bandmates arrived on stage around 9pm, to a wave of enthusiasm and resounding applause from the packed audience. Within seconds of hearing the foursome strike up an infectious funky groove, you could tell this gig was going to be an immense feast to the ears and eyes. The young ensemble featured the extraordinarily gifted talents of Ruslan Sirota on keys and piano, Caleb Sean McCampbell on keys/synths and occasional vocals, and wunderkind drummer Mike Mitchell – who at times near stole the show with his rhythmic splendour behind the kit. Each player is highly accomplished and multi-skilled in their own right; between them, they have won multiple awards, plus either produced, performed or recorded with a broad range of artists including some of the music industry’s biggest stars. The performance itself was nothing short of a master class in technical musicianship and improvisation of the highest level. And the audience couldn’t take their eyes off the musical wizardry that took place before them for the duration of the two-hour show. With jazz fusion at the core of The Stanley Clarke Band sound, combined with elements of funk, rock, soul and Latin influences, each piece was approached with the sense of an improvised jam. As Clarke took the lead, he laid down killer grooves and sweet melodic licks; decorated with innovative techniques like funky slap bass, Flamenco-esque strumming and harmonious bass chords. Before delving into lengthy solos where he practically made his bass guitar sing; as his fingers darted across the fret board with blistering speed and effortless precision. The set list included select tracks from his 40+ album discography and the odd cover, all of which fluidly segued into one another like the perfect album listening experience. A memorable highlight for many came in the shape of the anthemic ‘School Days’, which arrived midway through the set – and perhaps received the most jubilant applause of the evening. Widely credited with bringing the electric bass to the forefront as a lead instrument melodically and harmonically, Clarke played the absolute life out of his, with the same sublime technique and flair as originally performed on the title track of his highly influential 1976 LP of the same name. While it was his phenomenal execution of the bass solo, in particular, that had the whole venue awestruck; reaffirming his status as one of the greatest bass players of all time. Halfway through the set, the Philly native switched from the electric to the acoustic double bass to demonstrate his outstanding versatility. This segment featured some fine stripped-down jazz compositions, occasionally where Clarke performed solo or was accompanied by Sirota on piano – whose dexterous playing across the ivories draws comparisons to Chick Corea. Through to more upbeat material, plenty of which was punctuated by Mitchell’s thunderous and rhythmically complex drumming, that was met with joyous appreciation from the crowd. One of the many highlights here was the bands astounding cover of ‘Brazilian Love Affair’; the jazz-funk anthem originally composed by Clarke’s late friend and regular collaborator George Duke. The vocals were handled superbly by McCampbell who sang through a talk box that recalled the work of Roger Troutman, whilst working the keys of what appeared to be a classic Minimoog synthesizer. Like most of the numbers performed on the night, the four-piece freely extended the arrangement and meandered into improvised work outs that often culminated in epic individual solos. Without question, Clarke was the star attraction of the gig, yet that point didn’t overshadow the prodigious musicianship displayed by the young members of his band. At times while each player was afforded ample space to shine, the bassist put his instrument aside, took a seat and watched on with a sense of proudness. Starting out as teenage prodigy himself and taken under the wing of jazz greats such as Art Blakey and Stan Getz, Clarke’s influential role as a seasoned bandleader reflects his own formative years as a musician coming up. Having long had a knack for nurturing young, gifted players and providing a towering platform for a lucky few to showcase their sublime talent to the world, it highlights the celebrated bassist’s commendable habit of giving back. 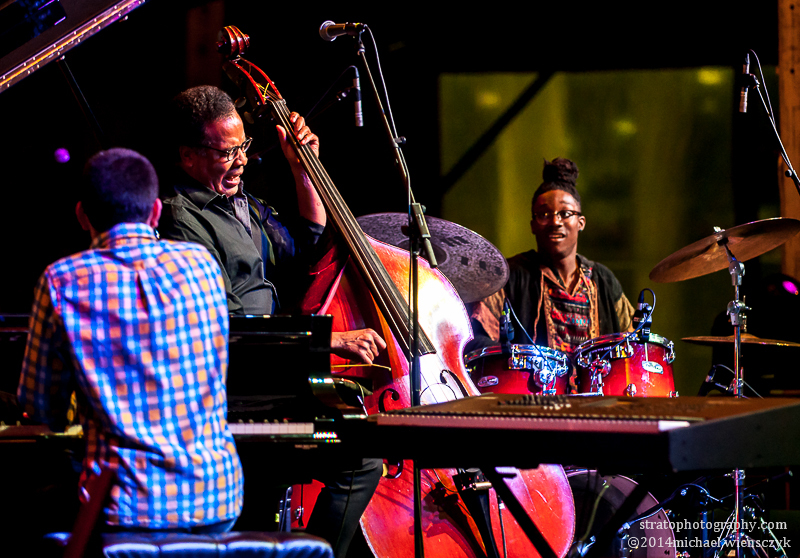 For many attendees, this enthralling show by the Stanley Clarke band also proved to be an introduction to another generation of musical virtuosos within the wider jazz genre and music as a whole.